The FM Series GPS receiver module is a self-contained high-performance Global Positioning System receiver designed for navigation, tracking and positioning applications. Based on the MediaTek chipset, it can simultaneously acquire on 66 channels and track on up to 22 channels. This gives the module fast lock times and high position accuracy even at low signal levels. 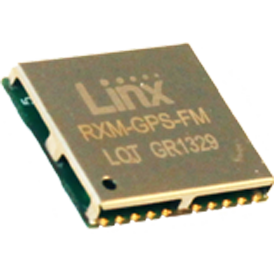 Also, read about the F4 GPS module from Linx. The module’s exceptional sensitivity gives it superior performance, even in dense foliage and urban canyons. Its very low power consumption of 12mA while tracking helps maximize runtimes in battery powered applications. 3-day ephemeris prediction enables extremely fast fix times. An exceptional ±11ns 1PPS accuracy makes the module suitable for timing applications. A standard UART serial interface is used to send and receive NMEA messages in ASCII format. A simple serial command set can be used to configure optional features. The module’s UART can be connected directly to the UART on a microcontroller or a PC using a USB or RS-232 converter chip. Housed in a compact reflow-compatible SMD package, the GPS receiver requires no programming or additional RF components (except an antenna) to form a complete GPS solution. This makes the FM Series easy to integrate, even by engineers without previous RF or GPS experience. Low Power: low 12mA tracking current that is less than half of competitive modules. A duty cycle mode further reduces power consumption.